​We were established over 40 years ago and are a small, friendly Pre-school set in the heart of the idyllic rural village of Easton not far from Framlingham and Woodbridge. We are situated in the Hamilton Room at EASTON FARM PARK; a bright, large open plan space providing a safe and stimulating environment. 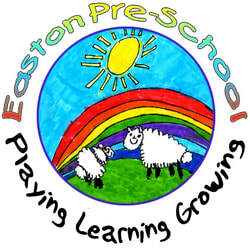 Parents choose Easton Pre-School because we offer a relaxed, homely approach to children's learning and development, one which really encourages parents to be part of the process. We have a small team of dedicated, experienced, qualified and enthusiastic staff who continually provide exciting learning experiences for the children: from art to cooking, messy play to gardening, woodland walks, and vast opportunitites to explore Easton Farm Park and its animals in all weather. We provide children with a rich variety of play activities, which enable them to take the lead in their learning. Our strong staff and parent partnership help to guide the children along the early stages enabling them to gain independence and confidence to reach their full potential and learn more about the world around them. We pride ourselves on providing excellent quality care and education and very good value for money. We are registered to receive Government funding in the term following the child’s 3rd birthday and for some two year olds, we are also able to accept 30 hours Childcare funding for working parents which is the new scheme lead by the government. We are ‘nappy happy’ taking children from 16 months. You are always welcome to visit and find out more, please contact us to arrange a time.